글라스고, 스코틀랜드의 스코티아 에어포트 호텔 | 호스텔월드에서 예약하세요. 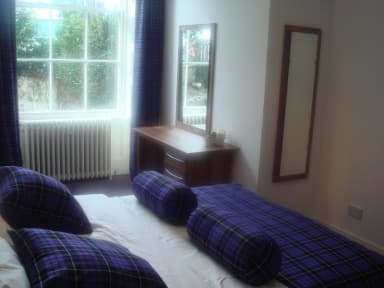 Welcome to Scotia Airport Hotel near Glasgow Airport which is located in a quiet residential area of Paisley. Our beautiful Georgian House building has undergone extensive upgrading to intertwine contemporary elegance within it’s beautiful original character to provide our guests with an amazing stay which we hope will want you to keep coming back and staying with us again and again! Ideal for either business or a short stay trip we are proud to offer the personal and caring touch to make sure you will not be disappointed with your stay at Scotia Airport Hotel. 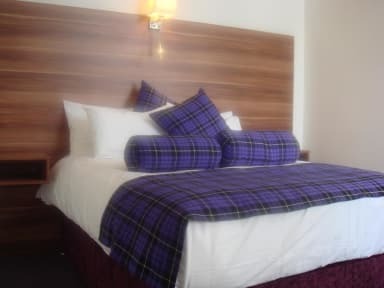 We are within close proximity to Glasgow Airport (less than 5 minutes away), the city centre of Glasgow, Inverclyde and Loch Lomond are all within commutable distance from the hotel. Also the university and museum and other local historical attractions are all within a 5 minute walk including the 12th century Paisley Abbey. Paisley Gilmour street railway station is a 5 minute walk and you can reach Glasgow Central Station within 10 minutes by train. All our rooms have private ensuite bathrooms with adjustable heating appliances, television, tea/coffee making facilities and a hair dryer. We offer a wide variety of accommodation for you to choose, from twin and double rooms to family rooms also with cot available upon request. In the morning taste our mouth watering cooked breakfast, the perfect start to a perfect day. Reception is open daily from 7am to 9pm. Late check in's after this time incur a charge and have to organised by prior arrangement at time of booking.